At least one homeless man has died during the freezing weather: he was found dead on Tuesday in his tent in the snow in Retford, Nottinghamshire. Jon Sparkes, chief executive of Crisis, the national charity for homeless people, said: “There seems to have been a bit of an open season with people trying to adopt approaches which are somehow seeking to ‘other’ people on the street, for example by referring to ‘aggressive begging’ or ‘clearing the streets’ and so on. 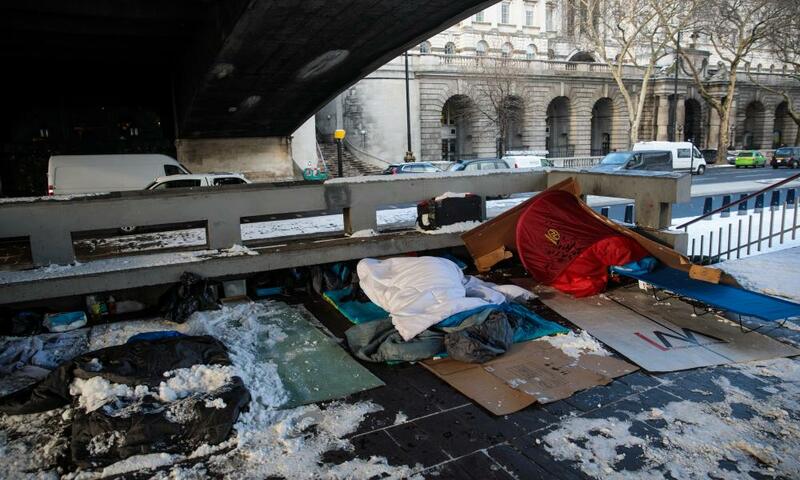 One problem was a lack of consistency by councils taking different approaches, he said, while praising the emphasis on tackling homelessness by the new mayor of the West Midlands, Andy Street. In Torquay, Chris Pannell, of the Torbay homeless charity Friends of Factory Row, linked the campaign there to what he described as more widespread open expressions of prejudice towards rough sleepers. “If we begin to blame beggars and rough sleepers for the ills of our community – and seaside resorts who rely on visitors are particularly sensitive to this issue – then there can be an underclass that is easily dehumanised and becomes more likely to be targeted,” he said.